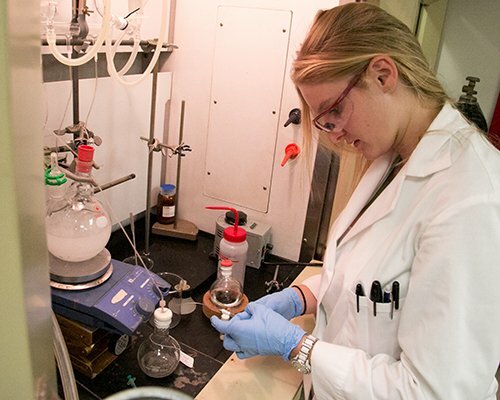 Gold award winner Brittany Smolarski worked to develop a simple method for making a variety of azacyclic compounds that could be used to make more useful and potent pharmaceuticals in the future. (THOUSAND OAKS, Calif. – Sept. 28, 2015) Thirty-five of California Lutheran University’s top undergraduates will present their research findings at the 12th Annual Student Research Symposium on Saturday, Oct. 10. The event, which will include presentations of awards to five students, will be held from 9 a.m. to noon on the Thousand Oaks campus. With guidance from faculty mentors, the students conducted research in the fields of biochemistry, biology, chemistry, computer science, economics, environmental science, exercise science, geology, global studies, mathematics, physics, political science and psychology.Most of the students spent the summer working full time on their projects. Three students will receive awards for dedication and excellence.Gold award winner Brittany Smolarski, a senior from Oak Park majoring in biochemistry, worked to develop a simple method for making a variety of azacyclic compounds that could be used to make more useful and potent pharmaceuticals in the future. Silver award recipient Kala Randazzo, a senior from Newbury Park majoring in psychology, investigated the effects of self-control and intentionally forgetting information on the process of forgiveness. Bronze award winner Katrina Brown, a senior from Pennsylvania majoring in biology and minoring in psychology, isolated microbes from soil in order to find bacteria that could produce new antibiotics to fight antibiotic resistance. Seniors Luis Burgos of Whittier and George Nasr of Newbury Park will receive leadership awards. They served as peer leaders for the summer researchers and organized weekly gatherings. Burgos, a biology major, studied whether male Western fence lizards with bigger and brighter blue patches on their bellies have larger territories with more females than others in their species. Nasr, a mathematics and computer science major, used differential equations and computer graphics to create a model of a three-dimensional droplet that moves and sloshes around. After the presentation of awards, six students will give oral presentations from 9:15 to 10:30 a.m. in Richter Hall in Ahmanson Science Center. All the students will present their results in demonstrations and posters and talk to visitors from 10:30 a.m. to noon in Overton Hall. Refreshments will be served. Ahmanson Science Center and Overton Hall are located on the south side of Memorial Parkway between Pioneer and Regent avenues. Admission to the symposium, which is sponsored by the Office of Undergraduate Research and Creative Scholarship, is free. For a complete schedule, visit CalLutheran.edu/OURCS. For more information, call 805-493-3796 or email OURCS@callutheran.edu.